South Kingstown – Coastal communities, residents, business and property owners are feeling the adverse effects of climate change due to sea level rise, coastal inundation, severe storm events, flooding and coastal erosion. Once known in the abstract as a global warming, big picture issue, the ill effects of carbon emissions and warming seas are taking their toll as government leaders at the national and local levels “prepare to prepare” their citizenry for future climate change crisis and emergent events. Matunuck Village tucked away on the south coast of Block Island Sound has residents and business owners embattled in a fight against Mother Nature, municipality and time. The severely eroding shoreline adjacent to homes and businesses in the village created a public safety concern for the Town that pitted residents against town and the state’s Coastal Resources Management Council (CRMC). The village, accessed by the sole two-lane Matunuck Beach Road, was and is in jeopardy of losing both road and the critical water supply infrastructure lying beneath due to continued coastal erosion and increased storm activity. Residents, business owners and town officials disagreed on a remedy for the deteriorating situation in the headlands and maintaining the integrity of the road. The discord resulted in property owners taking their own initiatives against the pounding surf, the town applying and receiving emergency assent to build a seawall, and state officials issuing violations. At a June 2014 meeting of the CRMC, Kevin Finnegan, owner of the Ocean Mist testified before CRMC, notifying the council of recently built armament structures along the experimental zone. Finnegan, who didn’t apply for experimental measures, concentrated on blocking the Town’s project in an effort to protect his business. Excerpts from interviews and the June standing-room only meeting are highlighted in the video below. 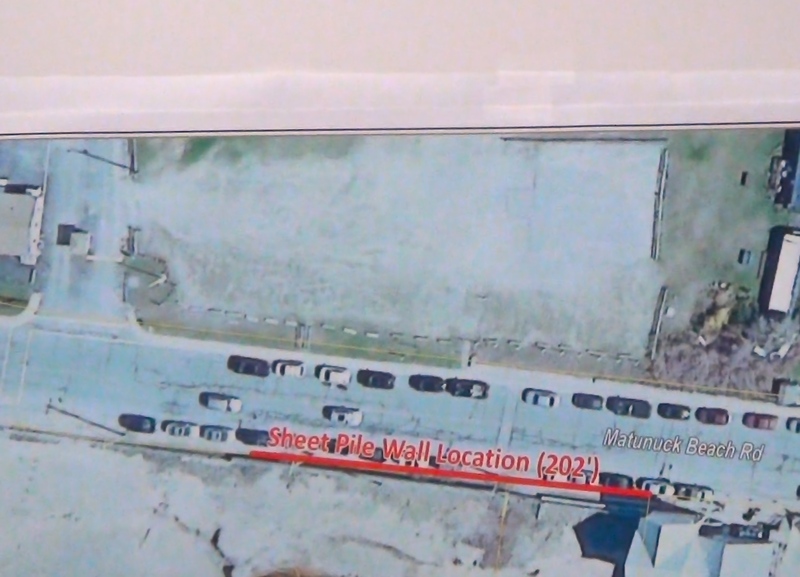 The Town received a $1.6 million Department of Transportation infrastructure grant to repair the deteriorating conditions and install a sheet pile construction wall along a 202 ft. span of road in danger of failing. It also received emergency assent under imminent peril from CRMC due to critical public health and safety concerns in the event of road failure. The seawall placement, directly adjacent to the Ocean Mist, a favored beach bar, restaurant and nightclub raised the alarm for proprietor, Kevin Finnegan, adjacent business owners and residents living along a 675 ft. stretch of adjacent beach , already suffering the erosive measures of nature and manmade structures. Embroiled in a years-long battle, CRMC developed an experimental erosion control Special Area Management Plan (SAMP) to allow private property owners the ability to work within environmental and regulatory guidelines to protect their properties. Forward momentum stalled as court and administrative hearings took hold, with only one resident applying for relief under the experimental plan. Residents and businesses along the stretch of shoreline identified in the SAMP received cease and desist orders as far back as December 2010 due to construction of non-permitted shoreline structures on their properties. Administrative fines imposed under the violations were held in abeyance by CRMC due to the creation of the SAMP plan and in anticipation of property owners’ applications for experimental erosion control approval. The deadline for application under the SAMP passed in January 2014. CRMC in June, under Superior Court remand, approved the Town of South Kingstown’s environmental and use conflict mitigation plan. Construction of the seawall remained on hold as the RI Superior Court considered the recent CRMC decision. CRMC director, Grover Fugate, in cooperation with RI Sea Grant, traveled to communities across the state to educate Rhode Island’s coastal population on climate change effects and the future of life at the shore in the ocean state. Speaking in terms of using armament structures to protect residences and businesses from the ocean at the door, Fugate used the deteriorating situation in Matunuck as an example. “Something you should realize with seawalls. None of them are built to protect the structure. None of them. In order to build a seawall on the south shore that will protect a structure, that seawall would have to be up to at least 26 feet tall,” said Fugate. Explaining the issue at a meeting of the Rhode Island Bays, Rivers and Watersheds Coordination Team in January, Fugate noted the extreme costs of the project. “And it would have to completely surround the structure because as the surge passes it will return on the backside and potentially take the structure on the backside. We’re talking about making massive investments that will not protect structures to begin with,” Fugate said. In May, Governor Lincoln Chafee announced the release of a draft report of the Rhode Island Executive Climate Change Council (ECCC). The report listed eight initiatives crucial to establishing a unified effort across Rhode Island’s 39 communities to address the issue of climate change. Chafee reminded the crowd that due to Rhode Island’s 400 miles of coastline, it was crucial that Rhode Island lead by example in dealing with negative impacts such as sea level rise and inundation. Abel Collins, Huffington Post blogger and former program director for Sierra Club’s Rhode Island chapter in an interview noted the need for coordination and planning. In June 2013, the Executive Office released President Barack Obama’s Climate Action Plan a 21-page plan to systematically cut carbon emissions across the nation, plan for the impacts of climate change, and lead globally, not only through government initiatives, but also at the community and individual levels. Speaking at Georgetown University, the President announced the release, noting the need for future generations to take action on reducing carbon emissions and pollutants. “Scientists had known since the 1800’s that greenhouse gases like carbon dioxide trap heat and that burning fossil fuels released those gases into the air,” said the President. Speaking on behalf of the Bicameral Task Force on Climate Change, Sen. Sheldon Whitehouse (D-RI) applauded the President’s initiative. Whitehouse and U.S. Rep. Henry A. Waxman (D-CA) formed the Bicameral Task Force on Climate Change in January 2013. According to the task force website, the committee was formed with the intent of educating Congress and the public on climate change, developing effective national policy. Along the Rhode Island Coast -south coast communities in the wake of Hurricane Sandy and the mounting evidence of future inundation events due to sea level rise, increased storm activity and continued erosion – prepared for action. Newport, Rhode Island’s City by the Sea and Wickford, already dealing with flooding and inundation, scheduled community meetings to educate residents and business owners on the growing threat of property loss and business shutdown due to ocean’s march onshore. 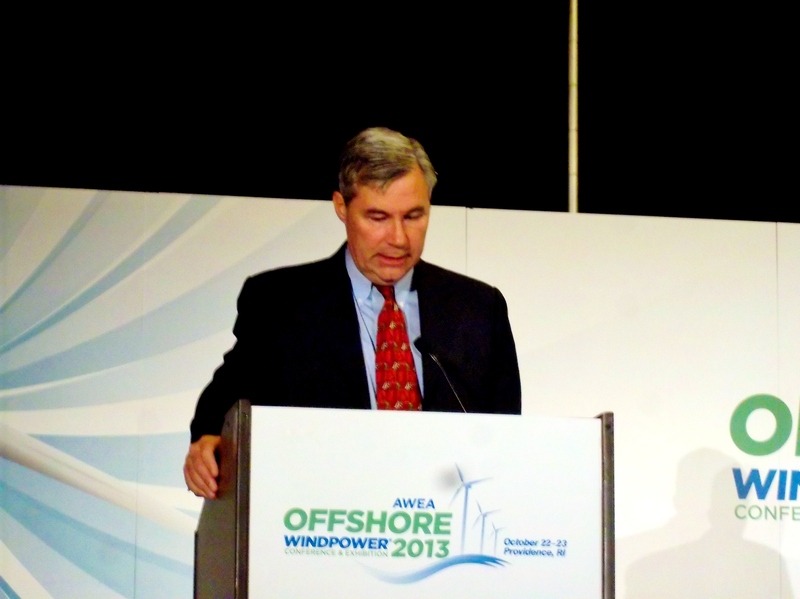 Whitehouse represented Rhode Island and the nation at the 2013 AWEA Offshore Wind conference held in Providence. Championing the use of offshore wind as a clean and renewable energy alternative to fossil fuels, Whitehouse joined Governor Lincoln Chafee in supporting the efforts of Deepwater Wind, LLC (DWW). The renewable energy developer, DWW, set to build the United State’s first offshore wind farm in Rhode Island waters, also won the first bid for Federal offshore wind leases. 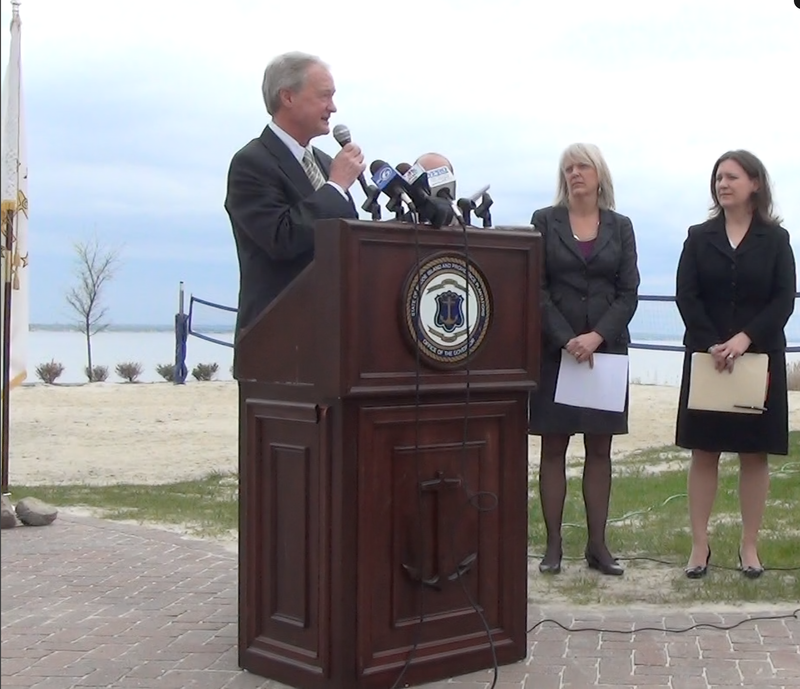 Rhode Island leaders Talk Offshore Wind from Tracey O’Neill on Vimeo. The project drew controversy and concerted efforts from the Town of Narragansett, Rhode Island and opposition groups from Rhode Island to New Jersey. Working with the State Coastal Resources Management Council, the Rhode Island Department of Environmental Management, the Conservation Law Foundation, the National Wildlife Federation, EPA, government officials, utility companies, and other environmental concerns, Deepwater Wind CEO, Jeffrey Grybowski was able to secure mainland landing in Narragansett for a bi-directional power cable linking BIWF and the island community of Block Island to the mainland. The approval allows the Block Island Community to reduce its dependence on diesel fuel, generating energy through wind power, while also tying into the mainland power supply. 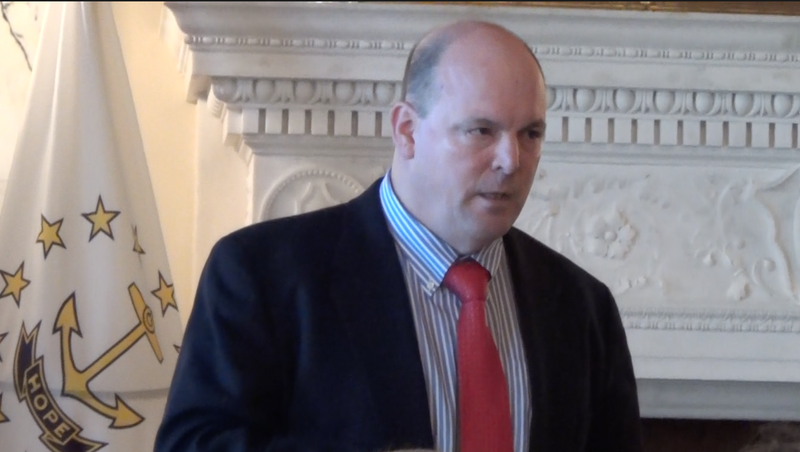 Jeff Grybowski Talks Accountability in Reporting from Tracey O’Neill on Vimeo. 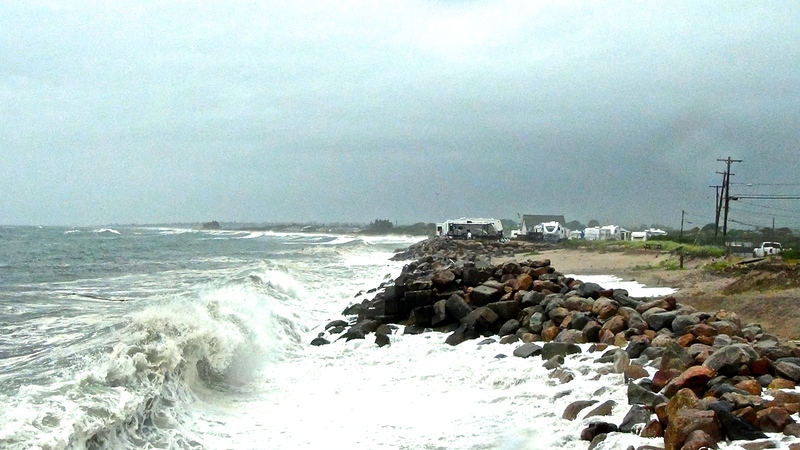 Well into hurricane season and not far from winter’s dreaded Nor’Easters, the situation in Matunuck may be decided by nature’s portage – beat down by rising seas, pounding surf and disappearing sands – long before written decisions and adjudicative decree. The time for application and abeyance passed under the experimental erosion plan, CRMC began the process of scheduling violation hearings in Matunuck. “It is our intention to have the illegal structures removed and experimental measures in place,” said Jeff Willis, Deputy Director of CRMC, at an October meeting of the council. Note: The Governor’s Executive Council on Climate Change (EC3) is now referred to as the RI Executive Climate Change Coordinating Council (EC4). Original article posted on TraceyC-Media October 19, 2014.